Add rustic style to your bedroom with this twin size comforter and sheet bedding set. This 6 piece bed in a bag set includes everything needed for a bedroom makeover, including a comforter, sham, microfiber sheets and a decorative embroidered pillow. Rich brown and green earth tones meet bold red accents in this woodsy bedding set. 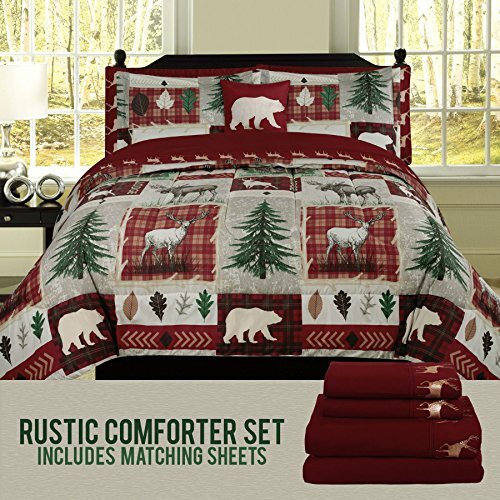 Bears, deer, evergreen trees and plaid patterns decorate the comforter and shams. You'll find the red carried over into the sheet set for a coordinating look. These patterns are perfect for lodge or cabin themed rooms. The set comfortably fits single beds.